Though 35 years have passed since the July 1976 flood, both the beautiful Colorado landscape and the hearts of those most closely affected are still scarred. “Reflection on the River,” compiled by Sharlynn Wamsley, is as remarkable to read this year of the 35th anniversary as it was when it was published in 2001. 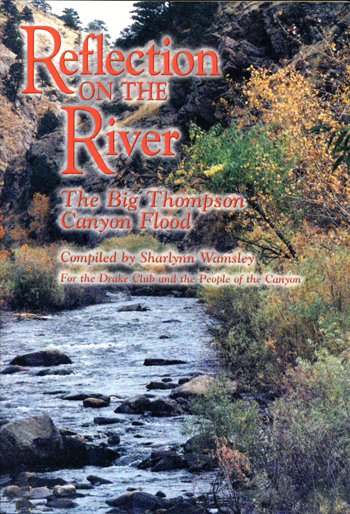 This book offers a short history of the Big Thompson canyon and a fold-out map of the flood area as helpful guides to the many first-hand accounts of loss and heroism that are an inevitable part of most disasters that pit nature against mankind. These stories are beautifully presented in the words of those who survived the mass destruction of the flood that forever changed the landscape of their lives as much as the landscape of the Big Thompson Canyon. It is easy to see that this book could be nothing short of a labor of love. What would prompt someone to tackle so large a task? When asked why she would take on such a project, author Wamsley shared, “We were visiting with each other at a meeting of the Drake Club and many of the women were recalling and sharing their experiences of the flood. They didn’t think that they had done anything that was big shakes but I thought it was interesting.” In the manner of a true genealogist, Wamsley thought to herself that they could not afford to lose those bits of living history when those people passed away or could no longer remember. “We (The Drake Club) had mimeographed copies of the ‘The History of the Big Thompson Canyon,’ published in 1938 or 1940 as part of the Extension Service program, for people who wanted more copies of the canyon’s history, so I guess that was the kind of book I had in mind when we began this book,” Wamsley wryly reflected. “Reflections” is actually a 456-page revision and expansion of the earlier 286-page book, “Reflection of the Hearts” that had been published in 1996 by Drake Club Press. When asked about the need for a revision, Wamsley explained that many people were somewhat leery of having their personal stories published in the original publication. After they saw that the stories of those involved had been honestly told with compassion and as much accuracy as possible, many more volunteered their stories. The story of the July 31, 1976, flash flood that claimed the lives of 144 people in the Big Thompson Canyon is uniquely retold in the same sequence as the flood wreaked its havoc from the top of the canyon down into the valley. This compilation reads like an action/adventure book at times, a love story at times and like a mystery at others. Readers will be saddened to the point of tears when they read some stories and horrified at the power of nature when they read other personal accounts. Throughout the book there is a prevailing sense of loss accompanied by hope and mankind’s underlying kindness. This book reads like a living history lesson from the mouths of those most intimately involved in the Big Thompson Canyon flood. It is then fitting that the Drake Club Press donated copies of “Reflection on the River” to every school and library in Larimer county and parts of northern Boulder county. This book is not just for those of us who live in or near the Big Thompson Canyon but also for anyone on your gift list who enjoys action stories, suspense thrillers and/or love stories. Most of all, and particularly in these trying times, this book is a treat for anyone needing to feel the power of the human spirit. “Reflection on the River” can be ordered at Drake Club Press, PO Box 45, Drake, CO 80515 or at author@drakeclubpress.com for $25, including shipping, handling and tax. All proceeds from the sale of “Reflection on the River” are placed in the Big Thompson Canyon Fund, an endowed fund in the Community Foundation of Northern Colorado. The book can also be ordered directly from the Recorder Online. The PayPal button on right side of this page is for “Reflection on the River.” The book will be shipped to the address shown in your payment. If the shipping address is different, you can email editor@berthoudrecorder.com with the shipping address. Site contents copyright © 2019 Recorder Online	except as noted. All rights reserved. | 90 queries in 2.145 seconds.